The MS Excellence Katharina is the ultimate in comfort offering a stylish interiors & spacious cabins. 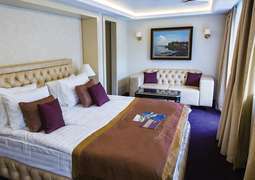 The ship boasts a wide variety of suites and staterooms which are suitable for any guests needs. All rooms boast picturesque views of the surrounding scenery with suites having balcony's as an added luxury. Savour the incredible selection of flavours on board the MS Excellence Katharina while you cruise. Whether it's a breakfast buffet or a four course meal you desire, this ship has it all. Dine on the local flavours of Russia and various international cuisines while taking in the superb views. There are two bars for you to enjoy a wide array of beverages and mingle with your fellow guests, a sun deck if you would like to take in some sun and excellent panoramic views from the Sky Lounge to keep you occupied while cruising.